Francis: Why do I have a strange suspicion that they placed a "Kick me" note on my back when they patted me on the back? lotacats - Nicea Italiana accenta, therea! Francis: Why are these mugs looking at me like that? 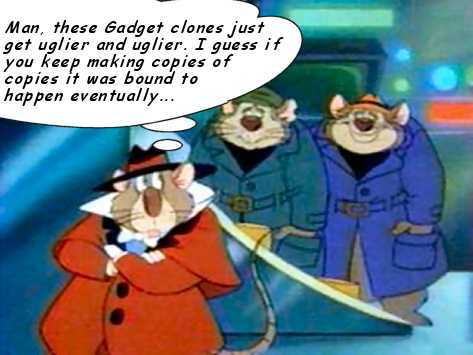 Are they thinking that I am a spy who is working for Gadget? Francis: Dang! Down to my final answer...is it A) Rat Capone, B) Francis, C) Seymour, or D) Double-O-Dale? Jeez, WHY did I bring *these* two lug nuts as my lifelines? CAPONE: Oh, drat! Hmmm... I wonder if *they* might have any Grey Poupon? Francis: When I ordered these two twin goons for the price of one, I thought I was getting the better deal because they were the same price as just one of the other selections. BUT I NEVER EXPECTED EACH ONE TO ONLY HAVE HALF THE BRAIN THAT ONE NORMAL GOON WOULD! ARGH!!!!! RedSwift - Ewwwww! Are you sure this isn't Capone? Capone: I wonder if they can smell that back there? I can always deny it. Francis: Dere wuz two aliens dere - now a coupla rats. Gots ta lay off dat booze. Francis: Great, that blond mouse smacks me and call me Capone and these two laugh at me! I look nothing like Capone, I think. Capone: Why can't, just this once, this crime slip through the cracks?